Idea for @mogdotcom: In addition to "New Releases" and "Just For You," add "New Releases Just for You." Would be cool personalization. Love it. @mogdotcom let me know they're working on personalizing new releases. Great idea, since they know what I like AND what's news. There was reason for optimism. 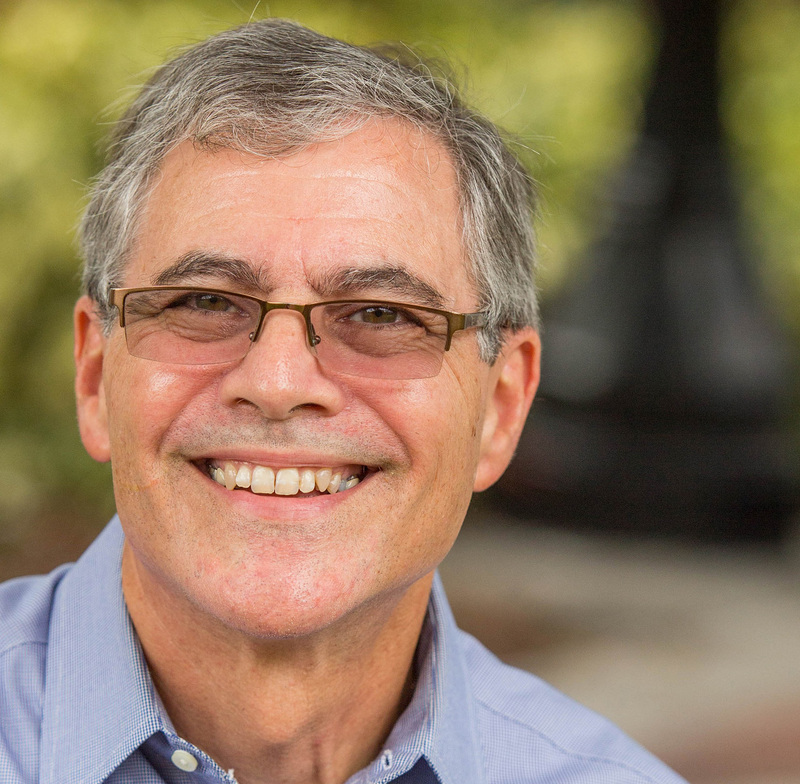 MOG had been bought by Beats Music. Users knew Beats was working on something new and it would be based on personalization. When Beats launched its new service in January, the company differentiated itself from Spotify and other competitors by making it super easy to find music you like supplemented by playlists from their expert curators. Some background: Subscribers to Beats Music pay $9.99 a month for access to more than 20 million songs. Unlike digital radio services such as Pandora, you choose exactly which songs and albums you want to hear. When you sign up, you select several music genres you like. Based on those genres and your age, the opening screen of Beats presents you with albums and music playlists you might enjoy. Over time as you use the service, the recommendations become much more targeted to your tastes. Now Beats knows me so well that it often suggests albums that I own and enjoy even though I’ve never searched for the particular artists. The first time I tried Beats, I was eager to find the new releases section to see how well they did at spotlighting the albums I would be interested in instead of the ones that would appeal to the widest audience. It took awhile, but I finally figured out that instead of a single New Releases page or box, you had to look under each of 32 genres to find new releases for each genre. I was able to narrow it down to about eight genres I was inclined to check regularly. But that’s a time-consuming hassle, and there were still plenty of releases I wanted to know about that weren’t getting attention. So I found a workaround. Each Tuesday, the day albums are released, I would check the New Releases page at allmusic.com, read the mini-reviews, and then go to the Beats app and add interesting albums to my library to listen later. 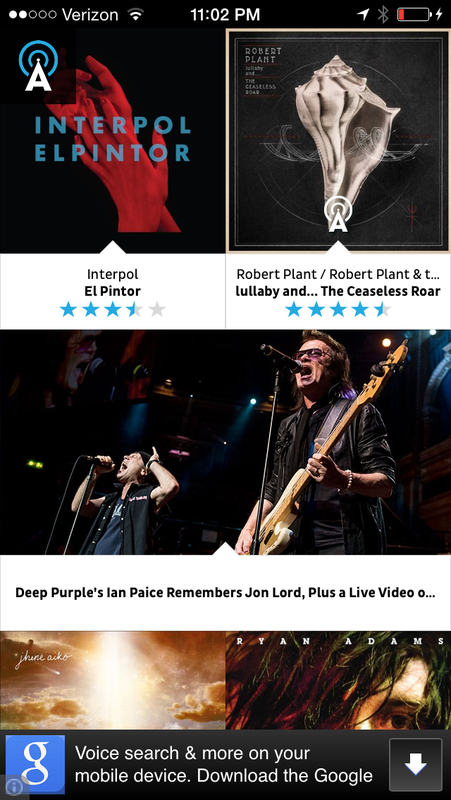 I was even happier when I discovered the AllMusic Roundup app that provides longer reviews and links to samples from each album. I thought the problem was solved. I was getting a lot more recommendations than I had at MOG or Beats, but I recently discovered that albums I was interested weren’t making the cut at allmusic.com. 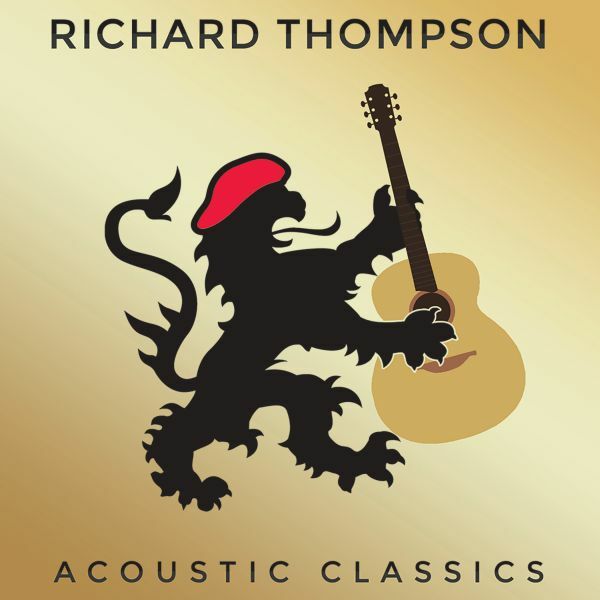 I stumbled upon Richard Thompson’s new CD several weeks after it was released in July. It wasn’t on the allmusic app or on any of the new release pages on Beats Music. Had somebody created a “new music just for you” app, Richard Thompson’s Acoustic Classics definitely would have been included. 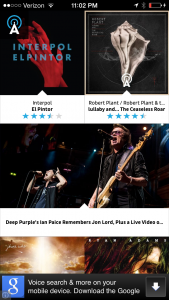 To its credit, AllMusic has a page listing all new releases, and it can be valuable. (I just discovered there that Jesse Winchester’s posthumous album comes out tomorrow.) But I rarely want to take time to wade through the several hundred albums it lists each week, many of which aren’t easily available. So it’s back to the drawing board. Or is it? This morning I remembered that Amazon recommends CDs I might like. I checked — and it’s suggesting the Richard Thompson CD. 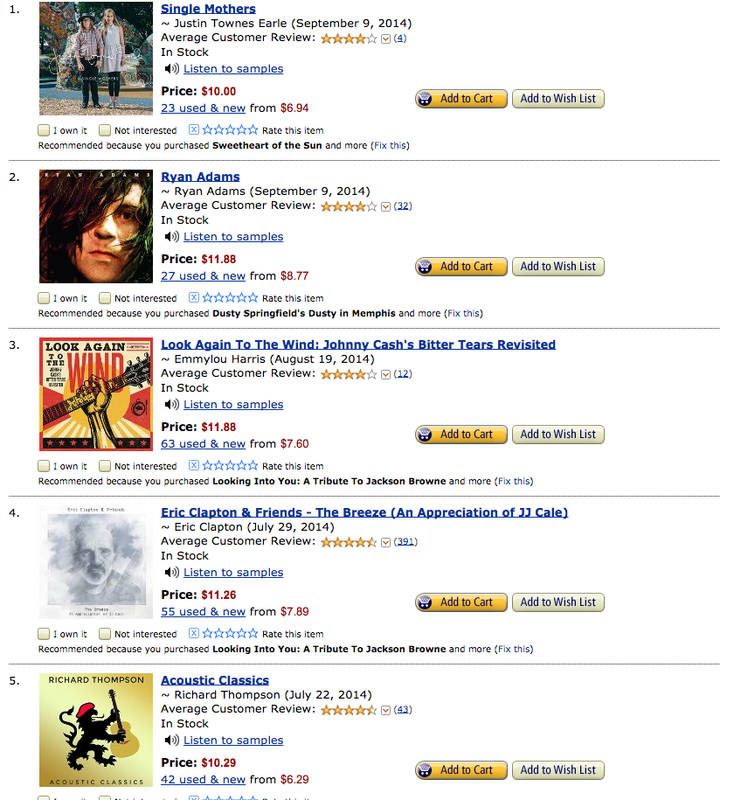 Amazon’s recommendations for me included the Richard Thompson CD. Amazon keeps its recommendations to a small number (you’re not as likely to spend if you’re overwhelmed with choices.) so it’s not the perfect solution. But it looks like we can count on the profit motive to give us a hint at a solution. Although I admit my playlist is populated mainly by artists who had their prime in the 60s and 70s, I still enjoy the new music of Mellencamp, Springsteen, Petty, Steve Earle, John Hiatt and Robert Earl Keen and U2. And sometimes Neil Young — although he goes off in many different directions. But I also enjoy some of the new music from The Hold Steady, Greg Laswell, Dawes, Frank Turner, David Francey, Arcade Fire, and William Topley, among others. Thanks, Tom. I’m familiar with a few of your newer musicians and like their work. I’ll have to check the others. It’s comforting to know that person-to-person recommendations still work.